Welcome to our new LEUCHTIE® Shop! Dogs are man's best friends. A life without dogs is unimaginable for many - this also applies to us! As we love dogs, their safety is very important to us. Like you, we like to spend a lot of time with our dogs. Depending on daily routine or season, this means that our daily walks must take place at dusk or in the dark. This makes it all the more important that we make our dogs visible in the dark to ensure their safety and that of our fellow human beings. We have taken on this task since 2003 and developed the LED collar LEUCHTIE®, which is manufactured exclusively in Germany. Since then it is permanently developed with our dogs. 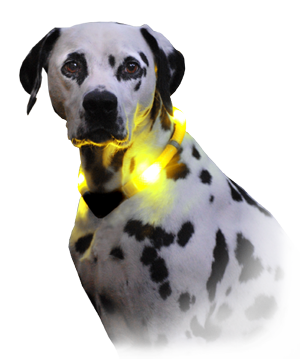 Trust LEUCHTIE® for the safety of your dog – completely reliable and proven in its use a hundred thousand times over. Our satisfaction guarantee: We want to inspire you! 30 days right of withdrawal - purchase without risk! All prices quoted here include VAT and plus shipping costs. * The 5-year warranty applies to private end consumers when purchasing a LEUCHTIE lighting collar in our retail shop. The warranty covers all material and manufacturing defects. The warranty does not cover batteries and accumulators, as well as damages caused by non-observance of the instruction manual or improper use, such as Bite damage, leaked batteries, etc. Here you will find the detailed warranty conditions.